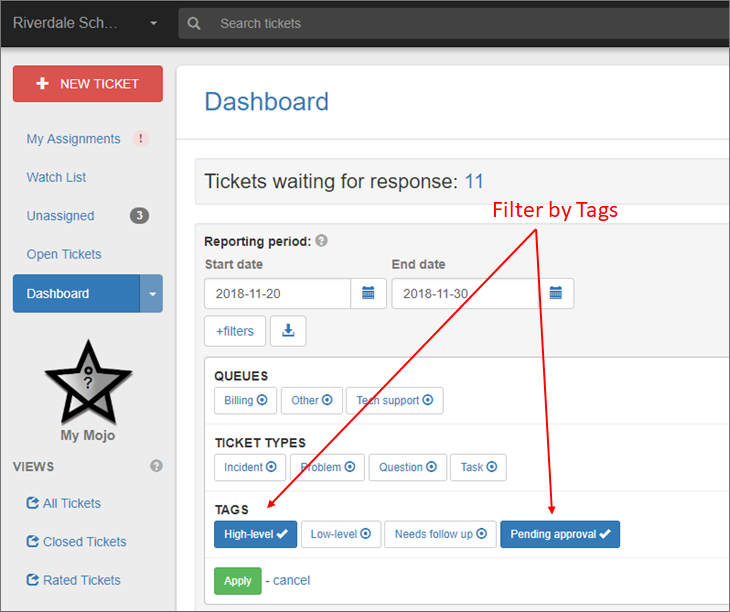 Mojo Helpdesk is introducing a new way to categorize and track tickets: ticket tags. 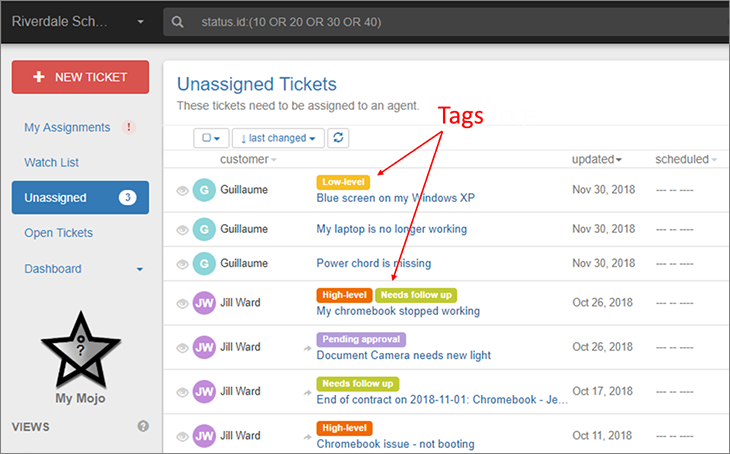 Similar to project board tags or email labels, Mojo Helpdesk now supports color-coded ticket tags. Tags can be added to any ticket easily, are completely customizable and self-defined. For example, tags can be set up to flag tickets with a secondary status ‘needs follow up’ or ‘pending approval’. Tags can also be used to set alternative priorities such as ‘high-level’ or ‘low-level’. Best of all triggers can be set up to take action on tagged tickets or to set tags automatically on certain types of tickets. Once tickets are tagged, agents can search tickets by tags using the search filters. Also, Managers and Admins can use the Dashboard report to filter by tags to see how many of those tickets were open or closed within a reporting period. To learn more about creating ticket tags or adding tags to ticket please visit Knowledge Base. Why have you removed the ability to open in a new tab or window. Very handy thing to able to do when reviewing multiple tickets. Seems to me this in an oversight. Can we please get this fixed. I agree with Mike . I open up several tabs through out the day. When I open up my list, I will put each ticket in a new tab. It makes it faster. Please fix. This is why I lost the ability to open a ticket in a new tab? I thought my browser was acting up. Please fix the ability to open a ticket in a new tab. Thank you! You guys are doing a great job with this site! I am able to open tickets in a new in Chrome. Right click the ticket description and select open link in a new tab. Same thing for a new ticket, right on the new ticket type and select open link in a new tab. It will be having the best part for the user to get the work very easily with a certain way that is approach perfectly to fixed the part very easily. Tags are a rather new and unusual way to solve many problems that often arise for users, but now they will be much less. And here is a useful feature pulled up. No, well, the tags themselves for eb is an extremely used function. It helps streamline and makes a very simple search by request. I’m glad they added them. The user can enter the necessary parameters to search for the tickets thanks to such a system. It is quick and convenient to find the relevant options.